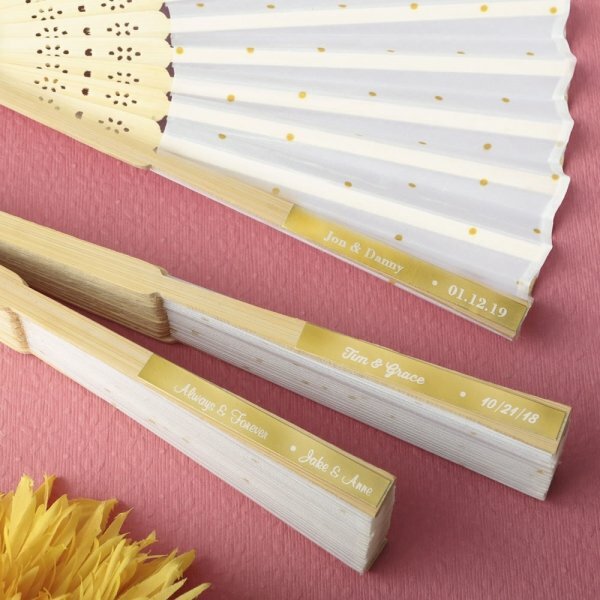 Thrill your guests with delicate folding fans decorated with a sprinkle of gold dots. Add a stunning metallic personalized sticker for a wow factor. Add a beautiful touch to your event tables with these pretty white fans decorated with a theme of delicate gold dots. The fans are fashioned from a light colored wood and feature a stunning intricately carved design. They have a collapsible ribbing structure with an outstretched silk fan attached. Folds into a compact shape and looks stunning when open! The fans can be personalized with a stunning metallic gold or metallic silver sticker with a choice of white or black print. Showcase your name and the date of your special event, creating an exclusive, luxurious gift that will be treasured for years to come.